Lord Krishna's words made their way to us after a long historical journey. This year marks the fiftieth anniversary of Srila Prabhupada's Bhagavad-gita As It Is. 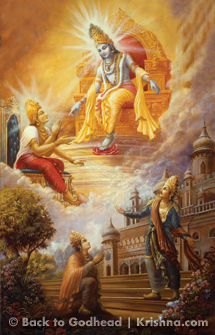 Although many articles have been written about the Gita as a philosophical poem, exploring its meaning and theological implications, and although both devotees and nondevotees have written elaborate studies of Srila Prabhupada's translation, few articles deal with the text as a historical phenomenon, something that came to us after a long journey of commentary and explication. Herein we find the history of the Bhagavad-gita traced from a remote time when it was delivered to the royal order, the kings of all planets. . . . At the present moment we have just passed through five thousand years of the Kali-yuga, which lasts 432,000 years. Before this there was Dvapara-yuga (800,000 years), and before that there was Treta-yuga (1,200,000 years). Thus, some 2,005,000 years ago, Manu spoke the Bhagavad-gita to his disciple and son Maharaja Ikshvaku, the King of this planet earth. The age of the current Manu is calculated to last some 305,300,000 years, of which 120,400,000 have passed. Accepting that before the birth of Manu, the Gita was spoken by the Lord to His disciple, the sun-god Vivasvan, a rough estimate is that the Gita was spoken at least 120,400,000 years ago; and in human society it has been extant for two million years. It was respoken by the Lord again to Arjuna about five thousand years ago. That is the rough estimate of the history of the Gita, according to the Gita itself and according to the version of the speaker, Lord Sri Krishna. For Bhaktivedanta, also known as Swami Prabhupada, the essential fact about the Bhagavad Gita is its speaker. The Gita contains the words of Krishna, and Krishna is "the Supreme Personality of Godhead." Just as Arjuna accepts Krishna as the divine Absolute during their conversation, so Swami Prabhupada accepts Krishna. In his view, all readers of his translation should do so, too. . . . Prabhupada sees his task as passing on the "mission" or presenting the "will" of Krishna. Other translations, he writes, are not authoritative because the translators have expressed their own opinions in them. By contrast, Prabhupada's translation presents the Bhagavad-gita As It Is. . . . [His] work was the first English translation of the Gita to supply an authentic interpretation from an Indian devotional tradition. And thanks to the indefatigable efforts of his ISKCON followers, the Bhagavad-gita As It Is has become by far the most widely distributed of all English Gita translations. The Bhaktivedanta Book Trust estimates that twenty-three million copies of Prabhupada's translation have been sold, including the English original and secondary translations into fifty-six other languages. The Bhagavad Gita was initially cradled in the pages of the Mahabharata and then weaned and suckled by traditional commentaries, initiated by Shankara and a host of Vaishnava sages. Madhva, Vallabha, Nimbarka and others took her in their arms and nurtured her, making sure that she grew tall and strong, as did luminaries of the Shaiva tradition. When she was mature enough to stand on her own two feet, Indian nationalists used her for their purposes. People like Gandhi and Tilak conscripted her into the service of Mother India, showing just how far her reach would go. Indeed, she reincarnates from generation to generation, and even displays a mellifluous voice in the modern era. From Wilkins and the Transcendentalists to Bhaktivedanta Swami Prabhupada, the Gita's staying power has proven formidable, embodying relevance and substance to the present day. Richard Davis has done an admirable job in writing her "biography," virtually allowing us to accompany her on her personal sojourn through life. From infancy to modernity, he highlights her maturation and the profound significance of her very being. Seeing the Gita as a living entity with a biographical narrative can be useful, allowing us to more deeply appreciate her various dimensions and the personalities who broadened her reach. It becomes clear from Davis's book that the Gita went through three important stages, culminating in Prabhupada's presentation. Even though the Gita originally appears in the sixth book of the Mahabharata (Bhishma-parva, chapters 23–40), it is recapitulated eight books later, in the Ashvamedha-parva (chapters 16–19). This latter text is called the Anu-gita, and though it differs considerably from Krishna's famous song, it is often considered its first commentary. Similarly, many Puranas elaborate upon various Gita verses, so that its central message of devotion to Krishna became clear for the tradition as a whole. Oddly, the first major commentary after direct scriptural elaboration belongs to Sankara (788–820 CE),* who tries to show that the Gita favors an impersonal Absolute. His arguments, however, are forced, and great acharyas arose to make that clear. Ramanuja (1017–1137), some two centuries later, was the first to explain the truth of Krishna's personhood, thus indirectly addressing Sankara's one-dimensional and limited view of reality. He was followed by Madhva (1238–1317), who took the notion of Krishna's personhood further, showing that devotional service (bhakti) is the ultimate teaching of the Gita. There were others as well, including Sridhara Svami in the 1400s. His important work is entitled Subodhini. These were the major commentators before the time of Sri Chaitanya Mahaprabhu (1486–1533), the combined incarnation of Radha-Krishna, and they represent the first stage of the Gita's historical development. Sri Chaitanya and His Six Goswamis did not write new Gita commentaries as such. Rather, they honored earlier work, especially that of Ramanuja, Madhva, and Sridhara Svami. That being said, both Rupa Goswami and Jiva Goswami quote the Gita extensively in their work, with Jiva devoting many verses to Krishna's words in his Shat-sandarbha. With the rise of consequential Gaudiya acharyas such as Vishvanatha Chakravarti (c.1626–c.1708) and Baladeva Vidyabhushana (c.1700–1793), we find Gita commentaries that would be pivotal for the tradition – the Sarartha-varshini-tika and the Gita Bhushana, respectively – bringing out inner Vaishnava teachings. But these texts, like the work of their Goswami predecessors, belong to the first developmental stage of the Gita's journey, since it is confined to Sanskrit. The next step, or the second stage, was to enhance the Gita's reach by taking it beyond the borders of its original language. This initially occurred contemporaneously with Madhva, sometime during the thirteenth century. It was then that Jnaneshvara (1275–1296), a Maharashtrian devotee influenced by the Varkari Movement (devoted to the Krishna deity Vittaleshvara) and the teachings of Sankara, wrote his version of the Gita (Bhavartha-dipika) in Marathi. Given the nirguna-bhakti (worship of the formless)predilection of his forebears, his text follows the impersonalistic slant of Advaita Vedanta. Additionally, he reconfigures the Gita's verses, rewriting and elaborating upon them rather than merely presenting them. Other Gita translations would follow, including Abu'l Fazl's (1551–1602) Persian edition and Francisco Benci's (1542–1594) Latin one. Then, in the nineteenth century, Bhaktivinoda Thakura (1838–1914) composed four Bengali books on the Bhagavad-gita. This began in 1886, when he released a commentary known as Rasika-ranjana based on the work of Vishvanatha Chakravarti. Five years later he released another (Vidvan-ranjana), based on Baladeva Vidyabhushana's work. In 1898 he published Madhva's commentary, and, posthumously, his estate released one of his earlier, shorter works, called Bhagavad-gita-dasha-mula, or "Ten Essential Principles of the Gita." Years later, in 1914, his son Bhaktisiddhanta Sarasvati Thakura (1874–1937) republished Vishvanatha's commentary on the Gita, and throughout the 1920s and 1930s he would periodically publish Bhaktivinoda's various editions. Although Sarasvati Thakura, like his Six Goswami predecessors, did not elucidate the Gita with a formal commentary, he frequently quoted or explained it in his writing. Eventually, in the 1930s and 1940s, his disciples wrote a series of English commentaries, though these are largely out of print. All of the above set the table for the Gita's third development: proliferation in European languages, reaching a zenith in Srila Prabhupada's Bhagavad-gita As It Is. Sir Charles Wilkins (1749–1836) translated the Gita into English for the first time in 1785. This led to an interest by luminaries no less prestigious than the American Transcendentalists, people like Emerson and Thoreau, who wrote about it and shared it with their contemporaries. Soon German translations followed, notably those of Friedrich Schlegel (1772–1829) and Richard von Garbe (1857–1927). As a result, European countries opened up to Indian wisdom, and numerous editions of the Gita eventually flooded the market. Enter the countercultural 60s and the hippie movement. By now the Gita had become more popular than ever. The Beats, precursors to the hippies, followed the cue of the Transcendentalists, enthralled as they were by the Gita's message. Edwin Arnold, Juan Mascaro, Christopher Isherwood, and others brought forth popular Gita paperbacks too numerous to mention, including those by prominent Sanskrit scholars such as Barbara Miller and R. C. Zaehner. These could be found on nearly every spiritual seeker's bookshelf. And then there was Srila Prabhupada. Why Is Prabhupada's Gita Special? Something peculiar happened when Prabhupada's edition was released in 1968. Seekers transformed into devotees. Lives were changed. Reading the Gita was no longer a mere intellectual exercise. It was a life-altering experience. Moreover, Prabhupada's edition, almost miraculously, was initially published by Macmillan, one of the largest international presses in America. They had agreed to publish a four-hundred-page version, sight unseen, but his original manuscript was well over a thousand pages. Consequently, he had his disciples edit the manuscript down to a severely abridged edition, the version released in 1968. Wanting his readers to have the full effect of his message, however, Prabhupada pushed for the eventual release of his complete text. Thus, in 1972, instigated by his urging but no less by substantial sales, Macmillan published his "Complete Edition," now again nearly a thousand pages. Prabhupada's 1972 version was arguably the most thorough and exhaustive of all English editions, even just from a literary point of view. Each verse was treated in the same comprehensive way: the Devanagari script was followed by its Roman transliteration, a word-by-word translation, and finally a full and original English rendering of the verse. Additionally, nearly all the verses included Prabhupada's clarifying commentary based on traditional Gaudiya Vaishnava works, including those of Sridhara Svami, Vishvanatha Chakravarti, Baladeva Vidyabhushana, and Bhaktivinoda Thakura, making the Gita's confidential message accessible and user-friendly. Prabhupada also formed an art department to create works that would adorn his books, and some of the paintings appeared in his Bhagavad-gita As It Is. Today the Bhaktivedanta Book Trust publishes Prabhupada's Gita and his other books in more than eighty languages, including French, German, Spanish, Italian, Polish, Hungarian, Russian, Kazakh, Chinese, Japanese, Vietnamese, Hebrew, Arabic, Swahili, and sixteen Indian languages. In the Gita's ninth chapter, Lord Krishna categorically advises Arjuna to surrender to Him and to love and worship Him. Krishna uses the word mam, meaning "unto Me." Yet, as Prabhupada would often remind his students, one famous Indian commentator wrote otherwise: "It is not to Krishna that we have to surrender, but to the unborn within him." But the Gita is clear that the essence of reality involves embracing Krishna's personal form with heart, mind, and soul. All aspects of Godhead are contained in Him. This truth, says Prabhupada, is not meant to be taken metaphorically. The Gita (18.75) carefully records this with the words krishnat sakshat kathayatah svayam, which clearly indicate that Krishna was directly (sakshat) in front of Arjuna articulating these teachings personally (svayam). Thus, given that this was Prabhupada's emphasis, his Gita may be considered the most accurate and true to the original text. Interpretations that differ do so for ulterior motives – political, financial, religious, and so on. But Srila Prabhupada's motive, as is evident from his life and commentary, was pure – the single-minded goal of distributing love for Krishna. Significantly, therefore, he entitled his Gita "As It Is," and he called his comments "Purports" (purport = meaning), not "Interpretations." In these purports he gives the actual significance of the verses, the direct meaning coming in a line of perfect masters from Krishna Himself – who all taught that the Gita's real message is devotion to Krishna. Who can truly understand this truth? The answer becomes clear from Krishna's statement to Arjuna in the fourth chapter: "That very ancient science of the relationship with the Supreme is today told by Me to you because you are My devotee as well as My friend and can therefore understand the transcendental mystery of this science." (Gita 4.3). Krishna discloses in that same chapter that the Gita can be understood only by those in a line of authorized devotees known as a parampara, or disciplic succession. Of the four such successions recognized by the Vedic literature, the Brahma-Madhva-Gaudiya-sampradaya is flourishing, and Srila Prabhupada is the thirty-second teacher in that line, his students carrying on the message even today. Those who understand the Gita by reading his edition can also consider themselves coming in this same prestigious lineage. According to the Bhagavad-gita, spiritual truths reach the most sincere students by a descending process, from the scriptures themselves, the great sages, and through a genuine, qualified spiritual teacher who guides one on the path of devotion. Thus the real import of the Bhagavad-gita is not to be had by incessant wrangling and a dazzling display of philosophical interpretation, but by filling one's heart with devotion and learning the art and science of Krishna consciousness. *All dates of predecessor acharyas in this article are approximations based on the latest scholarly research and traditional literature.